We have a beautiful view of the mountains from our apartment. It is something I have never lived with before, and I have quickly learned that just because you can see them, doesn’t mean you are in them. It still takes an effort, or planning to get there. 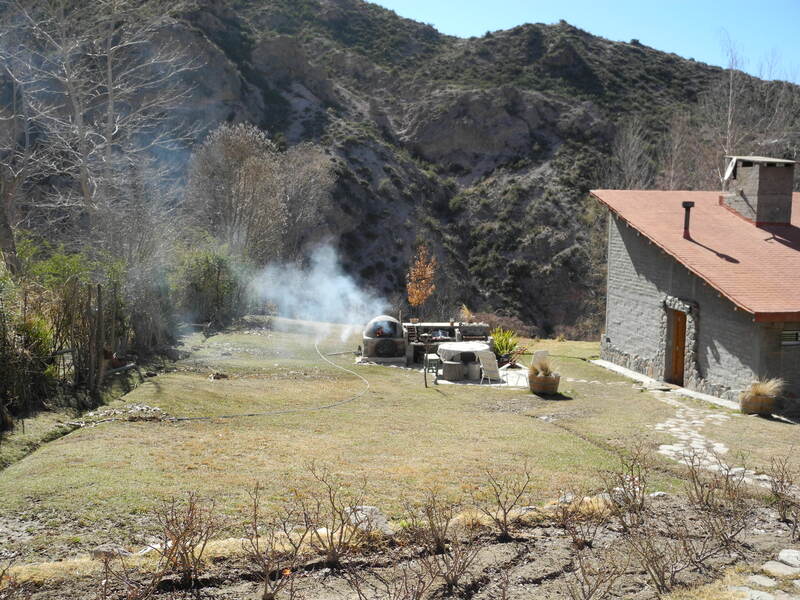 Fortunately for us, our dear neighbor Marta, a retired schoolteacher who lives alone downstairs from us invited us to her cabaña (cabin) in a small mountain community called Portrellilos. It is about an hour away at the foot of the front range called the Cordon del Plata. We had no idea how lucky we were! Marta, in her grandmotherly way (she has 7 grandchildren who live in Beunos Aires-about 8 hours away) nurtured us and gave us the ultimate Mendocinan treatment. It was relaxing, rejuvinating, gorgeous and comforting all in one. 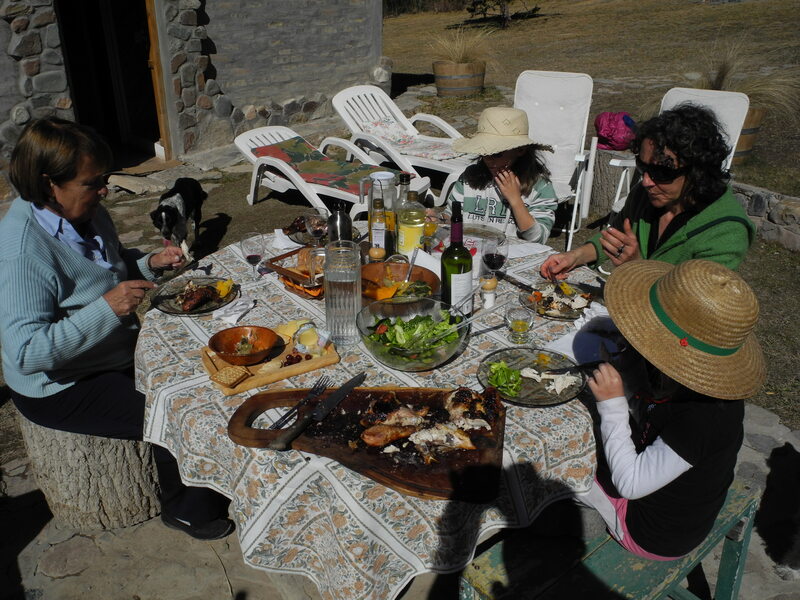 I am going to highlight our Sunday lunch, complete with simple chicken in the outdoor oven, seasonal vegetables, fermented wild cherries and of course, a good malbec. 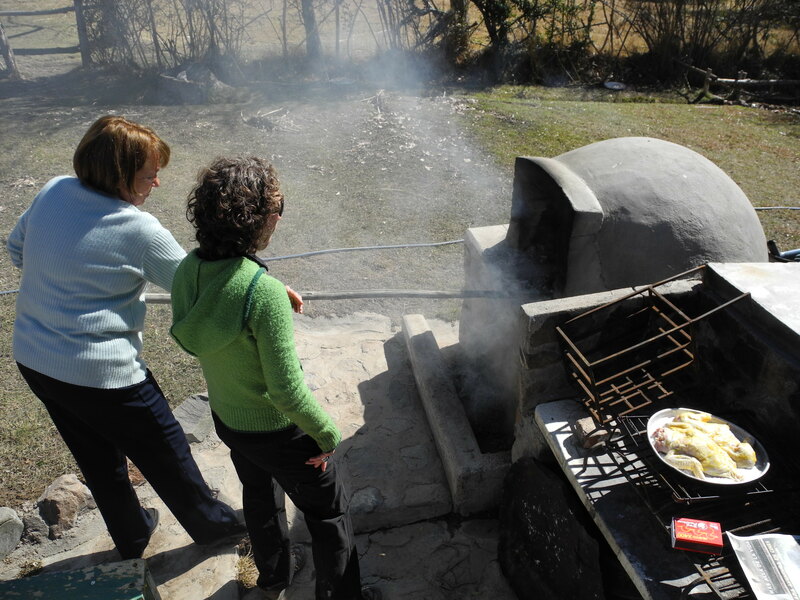 Marta started the oven while we were hiking in a nearby riverbed. These outdoor adobe style ovens are ubiquitous throughout the region. 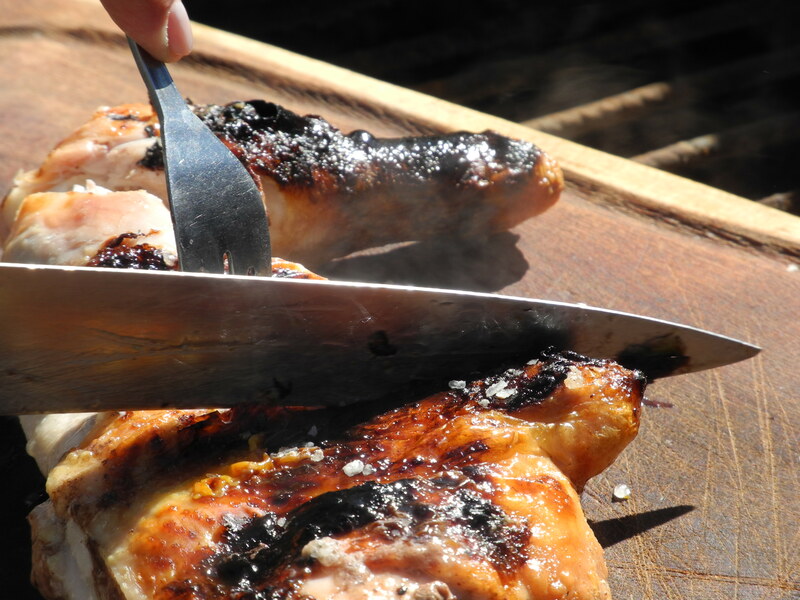 Even in the city, it is not uncommon to spot an outdoor grill of some sort as the ‘asado’ or grilled meat meal is ever popular here. 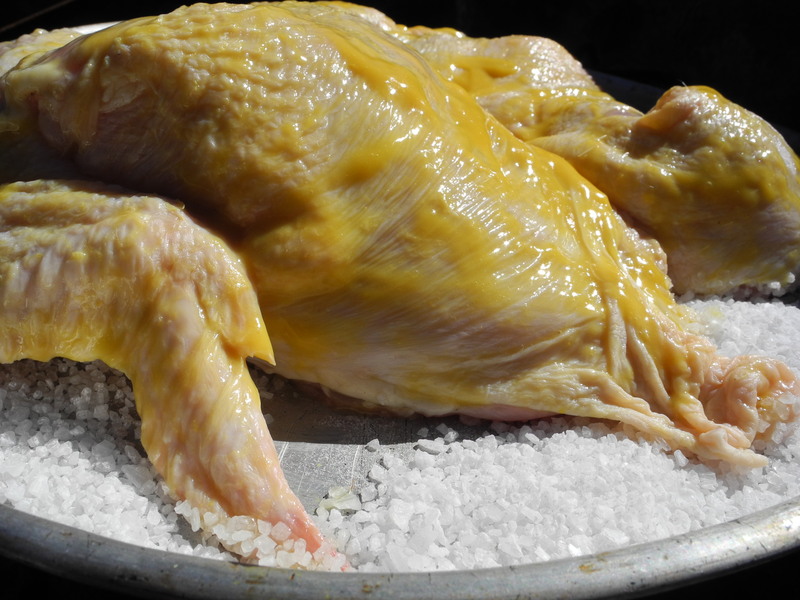 Our menu included the simplest of chicken recipes, one that I will repeat: A whole chicken coated with a thin layer of mustard, and covered thoroughly with LOTS of coarse sea salt. That’s it. 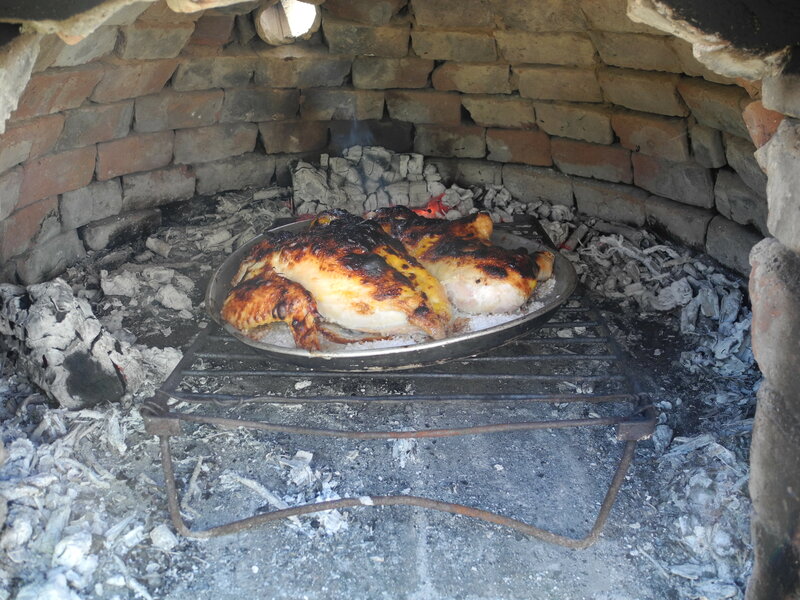 Marta cleared away most of the coals and used the heat contained within the oven to cook the chicken. She covered the door in order to retain the heat and the chicken cooked quite rapidly-in about 25 minutes. Steaming hot from the oven! Contrary to popular belief, Argentinians have access to, and eat plenty of vegetables. 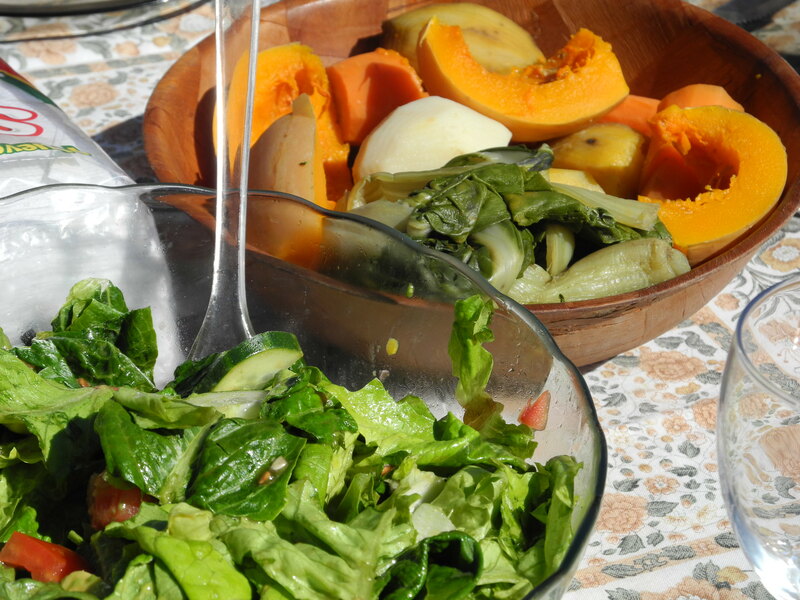 In addition to our bird, we had a beautiful salad with fresh avocadoes and tomatoes, and a mix of steamed squash, sweet potatoes, potatoes, and chard. Simple, and perfect for a sunny, 60 degree winter day! Traditional use of local ingredients is alive and well here and throughout the country. Unlike in the U.S, where we receive so much imported food, here everything comes from here, they simply don’t seem to have the economic stability to bring other products in. I believe there are numerous benefits to this, particularly when it comes to an authentic culinary culture. There are many fruits throughout the region, and you can find artesenal jams, pastes and preserves almost anywhere. Popular flavors are peach (durazno), quince (membrillo) and plum (ciruela). I noticed an interesting jar on top of Marta’s oven which I mistook for olives. Marta explained that these were ‘ginda’ which we finally figured out were wild cherries. 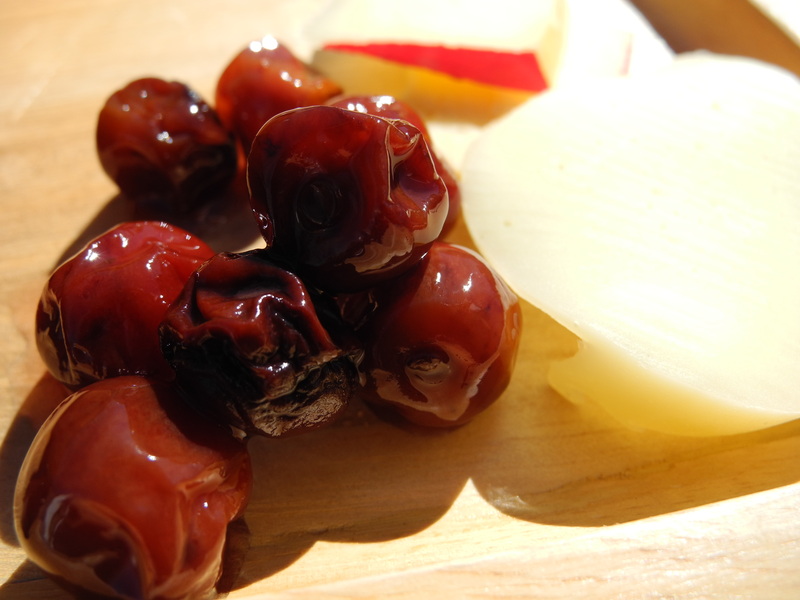 She had soaked them in sugar and water, and left them in the sun to ferment for a few weeks. They were tangy and sweet, with a slight flavor of fruity alcohol. Lovely with a nice gouda and some good crackers. This meal was only part of a delightful weekend for us. It reminded me slightly of special visits to the north shore, with chilly nights, fires in the morning and beautiful time outdoors. It was lovely to make a new friend and learn some new (old) cooking techniques! I am fantasizing about how to build one of these ovens in our back yard! The most important thing for me, and something I am learning about the Argentinian culture here, is the strong tradition of sharing a simple meal together. Family and food are the backbone of most socializing here, and it is a wonderful thing to be a part of! Wonderful setting and fabulous food. Looking at the pic…with the squash, it looks like it’s quartered, with most of the seeds removed, and then steamed? And…how’s that malbec tasting going? Any favorites yet? all root veggies steamed and served with olive oil and salt and pepper. Lovely, but not a lot of variety in how they eat their veggies. There is a great little vegetarian restaurant near our place-I gave them a cookbook, and they have a friend who is translating it into Spanish! Can’t wait to see what happens. As for the wine, I am meeting many folks in the biz, and going to a tasting on Sunday. Next step, arranging visits. Tough work, but someone has to do it. lovely!!! I want one of those ovens!! So happy for you and your family, Jenny. What an excellent adventure.